Print 153 Fish Bible. 153 Large Fish in John Bible - John explains his purpose for the use of 153 Fish, 153 large fish in John 21:11, as a metaphor. Bible points to the context. Was Jesus’ Mother the first to see our Resurrected Lord ? Pope John Paul II thought so. Where was Jesus at before Mary Magdalene saw Him ? How do we explain Mary’s absence from the tomb on Easter morning ? Love Opens the Door to Understanding and Knowledge. So, why do Sacred Scriptures not record this event ? 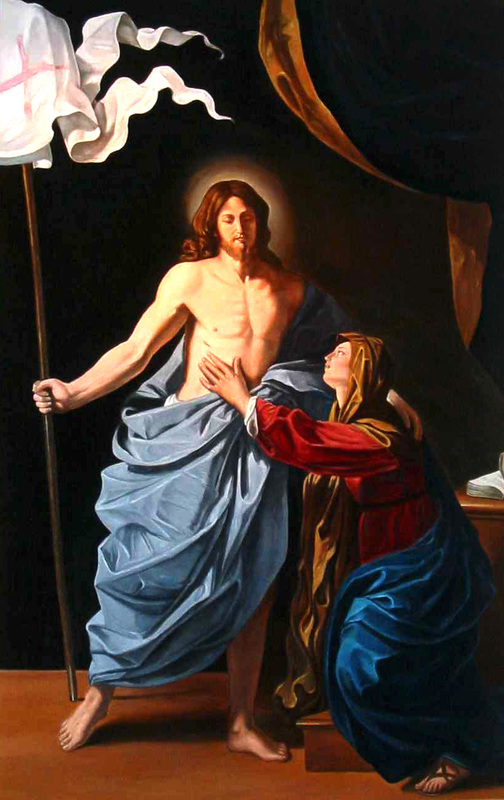 in his general audience of Wednesday, 21 May 1997 offered several reasons for concluding that the first person to see the resurrected Lord was His Mother, the Blessed Virgin Mary. Although this is not what we would call a defide teaching - Catholics are free to believe it or not - there is much spiritual fruit to be had by meditating on this point. Enemies of the Church will sometimes say that once a person becomes a Catholic he has to check his brain at the door and just let the Pope do the thinking for him. This could not be further from the truth. Pope John Paul II indirectly points this out by pointing to the vast area of theology that is not yet defined where we are free to explore deeper insights into God’s love. Those that deny that truth can be known are implying that their own attempts at thinking are fruitless. Truth is to the mind what food is to the mouth and body. At some point we are intended to chomp down on it. The mind was made to embrace objective truth. Just as comprehension of scientific laws enables us to go further into science, truth in other fields such as theology enables us to think more deeply and more profitably. A person who knows certain truths is more free, not less so. Does Mark 16:9 “he (Jesus) appeared first to Mary Magdalene” preclude the possibility of an earlier apparition to the Blessed Virgin Mary? No! See below Objection Answered. We have at least six reasons for concluding that Mary was the first to see our resurrected Lord. We have two biblical reasons, one reason based on justice, one based on love, and there is the historical testimony of our tradition and now John Paul II’s magisterial teaching. Mary, most likely a single mother at this point, was very devoted to her only Son and she followed Him all the way to the cross, even when most of the Apostles did not. She faithfully followed Jewish custom. (Luke 2:21-24, 39 John 2:2-5) No doubt Mary was exhausted with grief and probably slept a good part of the Sabbath, but after that what else would she have been thinking about other than her only Son ? When Mary Magdalene (Luke 24:10) went to finish anointing the body why did the Blessed Virgin Mary not go as well ? It only makes sense if Mary had known that Jesus was not there. Jesus had appeared to Mary first. Some will say that this conclusion is pure speculation, but then all attempts to answer questions that are not infallibly determined or defined involve speculation. One of the strengths of by John Paul II’s position is that a person can speculate as much as they wish and as long as they wish, but I don’t think they can arrive at another answer that is equally plausible. No other answer really fits or solves the above questions. If a person has one particular piece that fits perfectly into a puzzle and no other piece can fit and one cannot even imagine a piece that would truly fit, then it is reasonable to conclude that this particular piece is the correct one. John Paul II explains why Justice leads us to this conclusion. “ 3. … This inference would also be confirmed by the fact that the first witnesses of the Resurrection, by Jesus’ will, were the women who had remained faithful at the foot of the Cross and therefore were more steadfast in faith. Mary heard the hammer striking the nails as her Son was fastened to the cross. She saw with her own eyes the lance as it pierced His side and the water and blood that poured out onto the ground. Mary was in perfect union with the Son in his suffering on the Cross. She was filled with God's grace and had complete faith in Him from the beginning. So, from an argument based on justice we have another reason to conclude that Mary would have been the first to share in the joy of His Resurrection. Saint Augustine taught that the only one who held firm the Faith in the resurrection of Christ during the three days from Good Friday to Easter Sunday was Mary. She was the only believing member of the Church during that triduum. [So,] what share must not the Virgin-Mother have had in the joys of the Resurrection? We should hold it as a certain truth that Her most sweet Jesus, after His Resurrection, consoled Her first of all. Hopefully we all love our own mothers. Jesus, who is the perfect Son, loved his mother even more. Being God He perfectly fulfilled the 4th commandment. Jesus loves everyone, but Mary was most open and therefore she is the most perfect vessel to receive that love. If we would want to console our own mother’s sorrow, how much more so would Jesus. Love reveals what the skeptic is slow to believe. The tradition that Mary was the first to witness our Lord’s Resurrection. A fifth-century author named Sedulius claimed it was so. The Blessed Virgin Mary was the first to witness Jesus coming into the world as He took on flesh by the power of the Holy Spirit. And it was the Blessed Virgin Mary who first witnessed Jesus after He had rose from the dead by the power of the Holy Spirit as He came in His new resurrected flesh. (Romans 8:11)"
An insult to the glory and grace of Jesus Christ must be wrong. he is also providing us with a proof that Jesus did so. We need only to understand two principles. First typology and second how Mary is the most perfected of all creatures. Let us consider two different hypothetical individuals. The first person is very open to the grace that Jesus provides. The second person is less so. It would be an insult to the glory and grace of Jesus Christ if the second person who was less close to Jesus and who had refused some of his grace also participated to a greater extent in the heavenly glories than the first person, who was closer to Jesus Christ and His grace. Aren’t you Catholics placing Mary to high ? But now in the example on Mary she is the greatest of God’s creatures because she has the fullest co-operation and participation with God’s grace. She can point to no creature greater than herself because no creature co-operated with Jesus more than she did. If there was a greater participation by someone other than BVM in the Glories of Heaven such as Jesus’ resurrection by someone who was not as close to Jesus as was BVM that would be an insult to Jesus Christ because He is the sole source of all grace. Therefore, Mary had to be the first to participate in the heavenly glory of Jesus’ resurrection. And St. Ignatius of Loyola (1491-1556) also claimed it. by Ignatius of Loyola, George E Ganss, Paramanda Divakar, Edward J. Malastesta, Page 417. Now, with the teaching of John Paul II on Wednesday, 21 May 1997 we have that to consider. He did not claim that it was infallibly revealed, but he did say that it was reasonable to conclude that the Blessed Mother was the first to witness Jesus’ Resurrection and obviously he believed it as well. See Official Vatican Web Site to verify that. See John Paul II’s General Audience. A few will wrongly claim that Mark 16:9 “he appeared first to Mary Magdalene” precludes the possibility of an earlier apparition to the Blessed Virgin Mary. Is Mark 16:9 a valid proof for their claim ? Their flawed conclusion is based on the false assumption that Mark 16:9 allows for only one interpretation. Words can have several different meanings based on context. Many bible exegetes have affirmed that the wording is not conclusive as to who received the very first apparition. The great Fr. Cornelius a’ Lapide asserts that the word first indicates not an absolute priority, but only a relative priority specifically and exclusively to the events Mark decides to include. with the approval of Salmeron, Maldonatus, and a number of other exegetes, answers the difficulty drawn from Mark (16:9), "apparuit primo Mariae Magdalenae." He thinks that the custom of the Roman Church in placing the station for Easter at St. Mary Major confirms our opinion. The opinion being confirmed is that the Blessed Virgin Mary was the first to see the resurrected Lord. Therefore, the evangelist Mark was using the term “first” to convey the order of events after the resurrection that he [Mark] relates. First, Jesus appeared to Mary Magdalene, and then she went to and then she told the good news to the Apostles. It does not speak as to what may or may not have happened before the chain of events he describes. It does not by necessity preclude the possibility of an earlier apparition to Mary. The argument that Mark 16 precludes a visit to Blessed Virgin Mary before Magdalene is based on a supposed conclusion that is not definitive, therefore the proof is flawed. Most of the Church fathers do not address this issue. The ones who deny Mary was visited first base their argument on this flawed conclusion, therefore their testimony must be dismissed as unfounded. John 20:30-31 clues us in as to why this event need not be included in Scriptures, but looking further we can see a possible reason why the Holy Spirit would have wanted to leave this visitation out of the Bible. Perhaps He wanted to help us attain something more valuable than just data for our intellect. Our minds were made to wonder and meditate about things. On the one hand we can speculate about the sordid innuendos and accusations that our fallen world constantly throws our way, or we can speculate about the things of God. Perhaps God wanted us to open our hearts by getting us wonder where was Jesus when the tomb was found empty. What would have motivated His heart ? How much love did the perfect Son have for the perfect Mother ? Why would Mary be absent from the tomb? Did she already know something the others did not ? As we contemplate about Jesus we can draw much fruit as we think about how much we each love our own mother. Maybe God intended the answers to some questions to remain hidden until we pondered those questions with love in our hearts because only in the context of love could the real answers be known. Love opens heart as well as the mind to a deeper understanding of the things of God. For Best results download the PDF image. Then View and Print from free Adobe Reader, or else the fonts can get mangled. “The Gospel does not relate the apparition thus made by Jesus to his Mother, whereas all the others are fully described. It is not difficult to assign the reason. The other apparitions were intended as proofs of the Resurrection; this to Mary was dictated by the tender love borne to her by her Son. Both nature and grace required that His first visit should be to such a Mother, and christian hearts dwell with delight on the meditation of the mystery. There was no need of its being mentioned in the Gospel; the Tradition of the Holy Fathers, ... bears sufficient testimony to it; and even had they been silent, our hearts would have told it us.